Tibetan Buddhism (also Indo-Tibetan Buddhism) is the form of Buddhism named after the lands of Tibet where it is the dominant religion. It is also found in the regions surrounding the Himalayas (such as Bhutan, Ladakh, and Sikkim), much of Chinese Central Asia, the Southern Siberian regions such as Tuva, as well as in Mongolia. Tibetan Buddhism is a form of Mahayana Buddhism stemming from the latest stages of Indian Buddhism (and so is also part of the tantric Vajrayana tradition). It thus preserves "the Tantric status quo of eighth-century India." However, it also includes native Tibetan developments and practices. In the pre-modern era, Tibetan Buddhism spread outside of Tibet primarily due to the influence of the Mongol Yuan dynasty (1271–1368), founded by Kublai Khan, which ruled China, Mongolia and parts of Siberia. In the modern era, it has spread outside of Asia due to the efforts of the Tibetan diaspora. Apart from classical Mahayana Buddhist practices like the six perfections, Tibetan Buddhism also includes Tantric practices, such as deity yoga and the Six Dharmas of Naropa. Its main goal is Buddhahood or rainbow body. The main language of scriptural study in this tradition is classical Tibetan. Tibetan Buddhism has four major schools, namely Nyingma, Kagyu, Sakya and Gelug. The Jonang is a smaller school, and the Rimé movement is a recent nonsectarian movement which cuts across the different schools. Each school is independent and has its own monastic institutions and leaders. The native Tibetan term for Buddhism is "The Dharma of the insiders" (nang chos) or "The Buddha Dharma of the insiders" (nang pa sangs rgyas pa'i chos). This is contrasted with other forms of organized religion, which are termed chos lugs (dharma system), for example, Christianity is termed Yi shu'i chos lugs (Jesus dharma system). Westerners unfamiliar with Tibetan Buddhism initially turned to China for an understanding. There the term used was Lamaism (literally, "doctrine of the lamas": lama jiao) to distinguish it from a then-traditional Chinese form (fo jiao). The term was taken up by western scholars including Hegel, as early as 1822. Insofar as it implies a discontinuity between Indian and Tibetan Buddhism, the term has been discredited. Another term, "Vajrayāna" (Tib. dorje tegpa) is occasionally used mistakenly for Tibetan Buddhism. More accurately, Vajrayāna signifies a certain subset of practices and traditions which are not only part of Tibetan Buddhism, but also prominent in other Buddhist traditions. In the west, the term "Indo-Tibetan Buddhism" has become current, in acknowledgement of its derivation from the latest stages of Buddhist development in northern India. Samye was first gompa (Buddhist monastery) built in Tibet (775-779). While some stories depict Buddhism in Tibet before this period, the religion was formally introduced to Tibet during the Tibetan Empire (7th-9th century CE). Sanskrit Buddhist scriptures from India were first translated into Tibetan under the reign of the Tibetan king Songtsän Gampo (618-649 CE). This period also saw the development of the Tibetan writing system and classical Tibetan. A reversal in Buddhist influence began under King Langdarma (r. 836-842), and his death was followed by the so called Era of Fragmentation, a period of disunity during the 9th and 10th centuries. During this era, the political centralization of the earlier Tibetan Empire collapsed and civil wars ensued. In spite of this loss of state power and patronage however, Buddhism survived and thrived in Tibet. According to Geoffrey Samuel this was because "Tantric (Vajrayana) Buddhism came to provide the principal set of techniques by which Tibetans dealt with the dangerous powers of the spirit world... Buddhism, in the form of Vajrayana ritual, provided a critical set of techniques for dealing with everyday life. Tibetans came to see these techniques as vital for their survival and prosperity in this life." This includes dealing with the local gods and spirits (sadak and shipdak), which became a specialty of some Tibetan Buddhist lamas and lay ngagpas (mantrikas, mantra specialists). The late 10th and 11th centuries saw a revival of Buddhism in Tibet with the founding of "New Translation" (Sarma) lineages as well as the appearance of "hidden treasures" (terma) literature which reshaped the Nyingma tradition. In 1042 the Indian master Atiśa (982-1054) arrived in Tibet at the invitation of a west Tibetan king. His chief disciple, Dromton founded the Kadampa school of Tibetan Buddhism, one of the first Sarma schools. The Sakya, the Grey Earth school, was founded by Khön Könchok Gyelpo (1034–1102), a disciple of the great Lotsawa, Drogmi Shākya. It is headed by the Sakya Trizin, and traces its lineage to the mahasiddha Virūpa. Other influential Indian teachers include Tilopa (988–1069) and his student Naropa (probably died ca. 1040). Their teachings, via their student Marpa, are the foundations of the Kagyu, the Oral lineage tradition, which focuses on the practices of Mahamudra and the Six Dharmas of Naropa. One of most famous Kagyu figures was the hermit Milarepa, an 11th-century mystic. The Dagpo Kagyu, founded by the monk Gampopa who merged Marpa's lineage teachings with the monastic Kadam tradition is today the most influential Kagyu sub grouping. Tibetan Buddhism exerted a strong influence from the 11th century CE among the peoples of Inner Asia, especially the Mongols. The Mongols invaded Tibet in 1240 and 1244. They eventually annexed Amdo and Kham and appointed the great scholar and abbot Sakya Pandita (1182–1251) as Viceroy of Central Tibet in 1249. In this way, Tibet was incorporated into the Mongol Empire, with the Sakya hierarchy retaining nominal power over religious and regional political affairs, while the Mongols retained structural and administrative rule over the region, reinforced by the rare military intervention. Tibetan Buddhism was adopted as the de facto state religion by the Mongol Yuan dynasty (1271–1368) of Kublai Khan. It was also during this period that the Tibetan Buddhist canon was compiled, primarily led by the efforts of the scholar Butön Rinchen Drup (1290–1364). A part of this project included the carving of the canon into wood blocks for printing, and the first copies of these texts were kept at Narthang monastery. The Potala Palace in Lhasa, chief residence and political center of the Dalai Lamas. 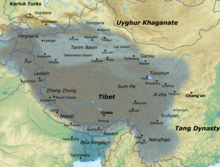 With the decline of the Yuan dynasty and the loose administration of the following (Han-Chinese) Ming dynasty (1368–1644), Central Tibet was ruled by successive local families from the 14th to the 17th century. Jangchub Gyaltsän (1302–1364) became the strongest political family in the mid 14th century. 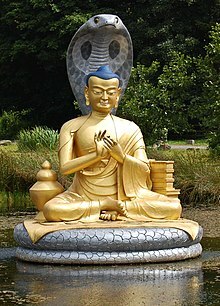 During this period the reformist scholar Je Tsongkhapa (1357–1419) founded the Gelug sect which would have a decisive influence on Tibet's history. Internal strife within the Phagmodrupa dynasty, and the strong localism of the various fiefs and political-religious factions, led to a long series of internal conflicts. The minister family Rinpungpa, based in Tsang (West Central Tibet), dominated politics after 1435. In 1565 the Rinpungpa family was overthrown by the Tsangpa Dynasty of Shigatse which expanded its power in different directions of Tibet in the following decades and favoured the Karma Kagyu sect. They would play a pivotal role in the events which led to the rise of power of the Dalai Lama's in the 1640s. In China, Tibetan Buddhism continued to be patronized by the elites of the Ming Dynasty. According to David M. Robinson, during this era, Tibetan Buddhist monks "conducted court rituals, enjoyed privileged status and gained access to the jealously guarded, private world of the emperors". The Ming Yongle Emperor (r. 1402–1424) promoted the carving of printing blocks for the Kangyur, now known as “the Yongle Kanjur”, and seen as an important edition of the collection. The Ming Dynasty also supported the propagation of Tibetan Buddhism in Mongolia during this period. Tibetan Buddhist missionaries also helped spread the religion in Mongolia. It was during this era that Altan Khan the leader of the Tümed Mongols, converted to Buddhism, and allied with the Gelug school, conferring the title of Dalai Lama to Sonam Gyatso in 1578. 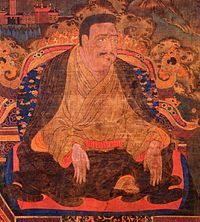 During a Tibetan civil war in the 17th century, the chief regent of the 5th Dalai Lama, Sonam Choephel (1595–1657 CE) with the help of the Güshi Khan of the Khoshut Mongols, conquered and unified Tibet and established the Ganden Phodrang government. The Ganden Phodrang and the successive Gelug tulku lineages of the Dalai Lamas and Panchen Lamas maintained regional control of Tibet from the mid-17th to mid-20th centuries. Yonghe Temple, a temple of the Gelug tradition in Beijing established in the Qing Dynasty. The Qing dynasty (1644-1912) established a Chinese rule over Tibet after a Qing expeditionary force defeated the Dzungars (who controlled Tibet) in 1720, and lasted until the fall of the Qing dynasty in 1912. 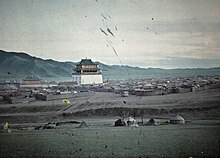 The Manchu rulers of the Qing dynasty supported Tibetan Buddhism, especially the Gelug sect, during most of their rule. The reign of the Qianlong Emperor was the high mark for this promotion of Tibetan Buddhism in China, with the visit of the 6th Panchen Lama to Beijing, and the building of temples in the Tibetan style, such as Xumi Fushou Temple, the Puning Temple and Putuo Zongcheng Temple (modeled after the potala palace). This period also saw the rise of the Rimé movement, a 19th-century nonsectarian movement involving the Sakya, Kagyu and Nyingma schools of Tibetan Buddhism, along with some Bon scholars. Having seen how the Gelug institutions pushed the other traditions into the corners of Tibet's cultural life, scholars such as Jamyang Khyentse Wangpo (1820-1892) and Jamgön Kongtrül (1813-1899) compiled together the teachings of the Sakya, Kagyu and Nyingma, including many near-extinct teachings. Without Khyentse and Kongtrul's collecting and printing of rare works, the suppression of Buddhism by the Communists would have been much more final. The Rimé movement is responsible for a number of scriptural compilations, such as the Rinchen Terdzod and the Sheja Dzö. During the Qing, Tibetan Buddhism also remained the major religion of the Mongols under Qing rule (1635–1912), as well as the state religion of the Kalmyk Khanate (1630–1771), the Dzungar Khanate (1634–1758) and the Khoshut Khanate (1642–1717). In 1912, following the fall of the Qing Dynasty, Tibet became de facto independent under the 13th Dalai Lama government based in Lhasa, maintaining the current territory of what is now called the Tibetan Autonomous Region. During the Republic of China (1912–1949), the "Chinese Tantric Buddhist Revival Movement" (Chinese: 密教復興運動) took place, and important figures such as Nenghai (能海喇嘛, 1886–1967) and Master Fazun (法尊, 1902–1980) promoted Tibetan Buddhism and translated Tibetan works into Chinese. This movement was severely damaged by during the cultural revolution however. After the Battle of Chamdo Tibet was annexed by the Chinese People's Republic in 1950. In 1959 the 14th Dalai Lama and a great number of clergy fled the country, to settle in India and other neighbouring countries. The events of the Cultural Revolution (1966–76) saw religion as one of the main political targets of the Chinese Communist Party and most of the several thousand temples and monasteries in Tibet were destroyed, with many monks and lamas imprisoned. Matters were made much worse by the Chinese Cultural Revolution. During this time, private religious expression, as well as Tibetan cultural traditions were suppressed. Much of the Tibetan textual heritage and institutions were destroyed, and monks and nuns were forced to disrobe. Outside of Tibet however there was a renewed interest in Tibetan Buddhism in places such as Nepal and Bhutan, while the spread of Tibetan Buddhism in the Western world was accomplished by many of the refugee Tibetan Lamas who escaped Tibet. After the liberalization policies in China during the 1980s, the religion began to recover with some temples and monasteries being reconstructed. Tibetan Buddhism is now an influential religion among educated Chinese and also in Taiwan. However, the Chinese government retains strict control over Tibetan Buddhist Institutions in the PRC. Quotas on the number of monks and nuns are maintained, and their activities are closely supervised. The 14th Dalai Lama meeting with U.S. President Barack Obama in 2014. Due to his widespread popularity, the Dalai Lama has become the modern international face of Tibetan Buddhism. Today, Tibetan Buddhism is adhered to widely in the Tibetan Plateau, Mongolia, northern Nepal, Kalmykia (on the north-west shore of the Caspian), Siberia (Tuva and Buryatia), the Russian Far East and northeast China. It is the state religion of Bhutan. 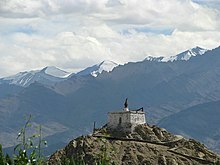 The Indian regions of Sikkim and Ladakh, both formerly independent kingdoms, are also home to significant Tibetan Buddhist populations, as are the Indian states of Himachal Pradesh (which includes Dharamshala and the district of Lahaul-Spiti), West Bengal (the hill stations of Darjeeling and Kalimpong) and Arunachal Pradesh. Religious communities, refugee centers and monasteries have also been established in South India. The Dharamsala administration under the Dalai Lama has nevertheless managed, over time, to create a relatively inclusive and democratic structure that has received broad support across the Tibetan communities in exile. Senior figures from the three non-Gelukpa Buddhist schools and from the Bonpo have been included in the religious administration, and relations between the different lamas and schools are now on the whole very positive. This is a considerable achievement, since the relations between these groups were often competitive and conflict-ridden in Tibet before 1959, and mutual distrust was initially widespread. The Dalai Lama’s government at Dharamsala has also continued under difficult circumstances to argue for a negotiated settlement rather than armed struggle with China. Kagyu-Dzong Buddhist center in Paris. In the wake of the Tibetan diaspora, Tibetan Buddhism has also gained adherents in the West and throughout the world. 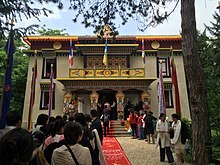 Tibetan Buddhist monasteries and centers were first established in Europe and North America in the 1960s, and most are now supported by non-Tibetan followers of Tibetan lamas. Some of these westerners went on to learn Tibetan, undertake extensive training in the traditional practices and have been recognized as lamas. Fully ordained Tibetan Buddhist Monks have also entered Western societies in other ways, such as working academia. ...that of a national or international network, generally centred around the teachings of a single individual lama. Among the larger ones are the FPMT, which I have already mentioned, now headed by Lama Zopa and the child-reincarnation of Lama Yeshe; the New Kadampa, in origin a break-away from the FPMT; the Shambhala network, deriving from Chögyam Trungpa 's organization and now headed by his son; and the networks associated with Namkhai Norbu Rinpoche (the Dzogchen Community) and Sogyal Rinpoche (Rigpa). Tibetan Buddhism upholds classic Buddhist teachings such as the four noble truths (Tib. pakpé denpa shyi), anatman (not-self, bdag med), the five aggregates (phung po) karma and rebirth, and dependent arising (rten cing ’brel bar ’byung ba). They also uphold various other Buddhist doctrines associated with Mahāyāna Buddhism (theg pa chen po) as well as the tantric Vajrayāna tradition. Samantabhadra, surrounded by numerous peaceful and fierce deities. The eleven faced and thousand armed form of the bodhisattva Avalokiteshvara. The Mahāyāna goal of spiritual development is to achieve the enlightenment of Buddhahood in order to most efficiently help all other sentient beings attain this state. This motivation is called bodhicitta (mind of awakening) — an altruistic intention to become enlightened for the sake of all sentient beings. Bodhisattvas (Tib. 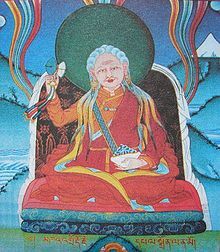 jangchup semba, literally "awakening hero") are revered beings who have conceived the will and vow to dedicate their lives with bodhicitta for the sake of all beings. Widely revered Bodhisattvas in Tibetan Buddhism include Avalokiteshvara, Manjushri, Vajrapani, and Tara. The most important Buddhas are the five Buddhas of the Vajradhatu mandala as well as the Adi Buddha (first Buddha), called either Vajradhara or Samantabhadra. Buddhahood is defined as a state free of the obstructions to liberation as well as those to omniscience (sarvajñana). When one is freed from all mental obscurations, one is said to attain a state of continuous bliss mixed with a simultaneous cognition of emptiness, the true nature of reality. In this state, all limitations on one's ability to help other living beings are removed. Tibetan Buddhism claims to teach methods for achieving Buddhahood more quickly (known as the Vajrayāna path). It is said that there are countless beings who have attained Buddhahood. Buddhas spontaneously, naturally and continuously perform activities to benefit all sentient beings. However it is believed that one's karma could limit the ability of the Buddhas to help them. Thus, although Buddhas possess no limitation from their side on their ability to help others, sentient beings continue to experience suffering as a result of the limitations of their own former negative actions. An important schema which is used in understanding the nature of Buddhahood in Tibetan Buddhism is the Trikaya (Three bodies) doctrine. The path of accumulation - in which one collects wisdom and merit, generates bodhicitta, cultivates the four foundations of mindfulness and right effort (the "four abandonments"). The path of preparation - Is attained when one reaches the union of calm abiding and higher insight meditations (see below) and one becomes familiar with emptiness. The path of seeing - one perceives emptiness directly, all thoughts of subject and object are overcome, one becomes an arya. The path of meditation - one removes subtler traces from one's mind and perfects one's understanding. The path of no more learning - which culminates in Buddhahood. The schema of the five paths is often elaborated and merged with the concept of the bhumis or the bodhisattva levels. Lamrim ("stages of the path") is a Tibetan Buddhist schema for presenting the stages of spiritual practice leading to liberation. In Tibetan Buddhist history there have been many different versions of lamrim, presented by different teachers of the Nyingma, Kagyu and Gelug schools. However, all versions of the lamrim are elaborations of Atiśa's 11th-century root text A Lamp for the Path to Enlightenment (Bodhipathapradīpa). The lesser person is to focus on the preciousness of human birth as well as contemplation of death and impermanence. The middling person is taught to contemplate karma, dukkha (suffering) and the benefits of liberation and refuge. The superior scope is said to encompass the four Brahmaviharas, the bodhisattva vow, the six paramitas as well as Tantric practices. Although lamrim texts cover much the same subject areas, subjects within them may be arranged in different ways and with different emphasis depending on the school and tradition it belongs to. Gampopa and Tsongkhapa expanded the short root-text of Atiśa into an extensive system to understand the entire Buddhist philosophy. In this way, subjects like karma, rebirth, Buddhist cosmology and the practice of meditation are gradually explained in logical order. A depiction of the tantric figures Hevajra and Nairātmyā, Tibet, 18th Century. Tibetan Buddhism is a form of Vajrayāna (Vajra vehicle), "Secret Mantra" (Skt. guhyamantra) or Buddhist Tantra, affirming the views espoused in the texts known as the Buddhist Tantras (dating from around the 7th century CE onwards). Tantra (Tib. rgyud) generally refers to forms of religious practice which emphasize the use of unique visualizations, ideas, symbols and rituals for inner transformation. The Vajrayana is seen by its adherents as the fastest and most powerful vehicle for enlightenment because it contains many skillful means (upaya) and because it takes the effect (Buddhahood itself, or Buddha nature) as the path (and hence is sometimes known as the "effect vehicle", phalayana). An important element of Tantric practice are tantric deities and their mandalas. These deities come in peaceful (shiwa) and fierce (trowo) forms. Another element of the Tantras is their use of transgressive practices, such as drinking taboo substances such as alcohol or sexual yoga. While in many cases these transgressions were interpreted only symbolically, in other cases they are practiced literally. A statue of one of the most important Buddhist philosophers for Tibetan Buddhist thought, Nagarjuna, at Samye Ling (Scotland). Madhyamaka, also called Shunyavada (the emptiness doctrine) is the dominant Buddhist philosophy of Tibetan Buddhism and is generally seen as the highest view, but is interpreted in various ways. Shunyata, the true nature of reality, or the emptiness of inherent existence (svabhava) of all things, is traditionally propounded according to a hierarchical classification of four classical Indian philosophical schools. While the classical tenets-system, as propagated by the Gelug school, is limited to four tenets (Vaibhāṣika, Sautrāntika, Yogācāra, and Madhyamaka), more complicated systems include also the shentong-view of the Jonang and the Kagyu, and also differentiates between the radical emptiness of the Gelugpa-school, and the experiential emptiness of the Nyingma and the Shakya. Vaibhāṣika (Wylie: bye brag smra ba). The primary source for the Vaibhāṣika is the Abhidharma-kośa of Vasubandhu and its commentaries. This system affirms an atomistic view of reality as well the view that perception directly experiences external objects. Sautrāntika (Wylie: mdo sde pa). The Abhidharmakośa was also an important source for the Sautrāntikas. Dignāga and Dharmakīrti are the most prominent exponents. As opposed to Vaibhāṣika, this view holds that we do not directly perceive the external world, only phenomenal forms caused by objects and our senses. Yogācāra, also called Cittamātra "Mind-Only" (Wylie: sems-tsam-pa). Yogacārins base their views on texts from Maitreya, Asaṅga and Vasubandhu. Yogacara is often interpreted as a form of Idealism. The system is entirely rejected by the Gelugpa, but elements of it form part of the teachings of the other schools. 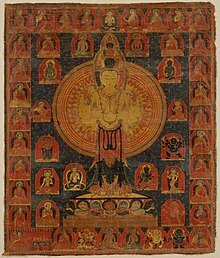 Madhyamaka (Wylie: dbu-ma-pa) - The philosophy of Nāgārjuna and Āryadeva, which affirms that everything is empty of essence (svabhava) and is ultimately beyond concepts. Intellectual emptiness, which is realized by absolute denial. This is the view of Tsong Khapa and the Gelugpa school, which rejects any statements on an absolute reality beyond mere emptiness. Experiential emptiness, which is realized when the understanding of intellectual emptiness gives way to the recognition of the true nature of mind, c.q. rigpa. This is the view of Nyingma (Dzogchen) and Sakya. Shentong, systematised by Dolpopa, and based on Buddha-nature teachings and influenced by Śāntarakṣita's Yogacara-Madhyamaka. It states that the nature of mind shines through when emptiness has been realized. This approach is dominant in the Jonang school, and can also be found in the Kagyu tradition. The tenet systems are used in monasteries and colleges to teach Buddhist philosophy in a systematic and progressive fashion, each philosophical view being seen as more subtle than its predecessor. Therefore, the four tenets can be seen as a gradual path from a rather easy-to-grasp, "realistic" philosophical point of view, to more and more complex and subtle views on the ultimate nature of reality, culminating in the philosophy of the Mādhyamikas, which is widely believed to present the most sophisticated point of view. Non-Tibetan scholars point out that historically, Madhyamaka predates Yogacara, however. A leaf from a Prajñāpāramitā (Perfection of Wisdom) manuscript. Study of major Buddhist Indian texts is central to the monastic curriculum in all four major schools of Tibetan Buddhism. Memorization of classic texts as well as other ritual texts is expected as part of traditional monastic education. Another important part of higher religious education is the practice of formalized debate. The canon was mostly finalized in the 13th century, and divided into two parts, the Kangyur (containing sutras and tantras) and the Tengyur (containing shastras and commentaries). The Nyingma school also maintains a separate collection of texts called the Nyingma Gyubum, assembled by Ratna Lingpa in the 15th century and revised by Jigme Lingpa. Among Tibetans, the main language of study is classical Tibetan, however, the Tibetan Buddhist canon was also translated into other languages, such as Mongolian and Manchu. During the Yuan, Ming and Qing dynasties, many texts from the Tibetan canon were also translated into Chinese. Numerous texts have also recently been translated into Western languages by Western academics and Buddhist practitioners. Among the most widely studied sutras in Tibetan Buddhism are Mahayana sutras such as the perfection of wisdom or Prajñāpāramitā sutras, and others such as the Saṃdhinirmocana-sūtra, and the Samādhirāja Sūtra. Buddhist monk Geshe Konchog Wangdu reads Mahayana sutras from an old woodblock copy of the Tibetan Kangyur. He is seated at a special sutra stool, wearing the traditional woolen Ladakhi hat and robe, allowed by Vinaya for extremely cold conditions. The study of Indian Buddhist texts called shastras is central to Tibetan Buddhist scholasticism. Since the late 11th century, traditional Tibetan monastic colleges generally organized the exoteric study of Buddhism into "five great textual traditions" (zhungchen-nga). Also of great importance are the "Five Treatises of Maitreya" including the influential Ratnagotravibhāga, a compendium of the tathāgatagarbha literature, and the Mahayanasutralankara, a text on the Mahayana path from the Yogacara perspective, which are often attributed to Asanga. Practiced focused texts such as the Yogācārabhūmi-Śāstra and Kamalaśīla's Bhāvanākrama are the major sources for meditation. While the Indian texts are often central, original material by key Tibetan scholars is also widely studied and collected into editions called sungbum. The commentaries and interpretations that are used to shed light on these texts differ according to tradition. The Gelug school for example, use the works of Tsongkhapa, while other schools may use the more recent work of Rimé movement scholars like Jamgon Kongtrul and Jamgon Ju Mipham Gyatso. A corpus of extra-canonical scripture, the treasure texts (terma) literature is acknowledged by Nyingma practitioners, but the bulk of the canon that is not commentary was translated from Indian sources. True to its roots in the Pāla system of North India, however, Tibetan Buddhism carries on a tradition of eclectic accumulation and systematisation of diverse Buddhist elements, and pursues their synthesis. Prominent among these achievements have been the Stages of the Path and mind training literature, both stemming from teachings by the Indian scholar Atiśa. In Tibetan Buddhism, the Buddhist Tantras are divided into four or six categories, with several sub-categories for the highest Tantras. In the Nyingma, the division is into Outer Tantras (Kriyayoga, Charyayoga, Yogatantra); and Inner Tantras (Mahayoga, Anuyoga, Atiyoga (Tib. Dzogchen)), which correspond to the Anuttarayogatantra. For the Nyingma school, important tantras include the Guhyagarbha tantra, the Guhyasamaja tantra, the Kulayarāja Tantra and the 17 Dzogchen tantras. Kriyayoga - These have an emphasis on purification and ritual acts and include texts like the Mañjuśrīmūlakalpa. Charyayoga - Contain "a balance between external activities and internal practices", mainly referring to the Mahāvairocana Abhisaṃbodhi Tantra. Yogatantra, is mainly concerned with internal yogic techniques and includes the Tattvasaṃgraha Tantra. Mother class tantras, which emphasize illusory body and completion stage practices and includes the Guhyasamaja tantra and Yamantaka tantra. Father class, which emphasize the development stage and clear light mind and includes the Hevajra Tantra and Cakrasamvara Tantra. It is important to note that the root tantras themselves are almost unintelligible without the various Indian and Tibetan commentaries, therefore, they are never studied without the use of the tantric commentarial apparatus. There is a long history of oral transmission of teachings in Tibetan Buddhism. Oral transmissions by lineage holders traditionally can take place in small groups or mass gatherings of listeners and may last for seconds (in the case of a mantra, for example) or months (as in the case of a section of the Tibetan Buddhist canon). It is held that a transmission can even occur without actually hearing, as in Asanga's visions of Maitreya. An emphasis on oral transmission as more important than the printed word derives from the earliest period of Indian Buddhism, when it allowed teachings to be kept from those who should not hear them. Hearing a teaching (transmission) readies the hearer for realization based on it. The person from whom one hears the teaching should have heard it as one link in a succession of listeners going back to the original speaker: the Buddha in the case of a sutra or the author in the case of a book. Then the hearing constitutes an authentic lineage of transmission. Authenticity of the oral lineage is a prerequisite for realization, hence the importance of lineages. In Tibetan Buddhism, practices are generally classified as either Sutra (or Pāramitāyāna) or Tantra (Vajrayāna or Mantrayāna), though exactly what constitutes each category and what is included and excluded in each is a matter of debate and differs among the various lineages. According to Tsongkhapa for example, what separates Tantra from Sutra is the practice of Deity yoga. While it is generally held that the practices of Vajrayāna are not included in Sutrayāna, all Sutrayāna practices are common to Vajrayāna practice. Traditionally, Vajrayāna is held to be a more powerful and effective path, but potentially more difficult and dangerous and thus they should only be undertaken by the advanced who have established a solid basis in other practices. The practice of Dāna (giving) while traditionally referring to offerings of food to the monastics can also refer to the ritual offering of bowls of water, incense, butter lamps and flowers to the Buddhas and Bodhisattvas on an shrine or household altar. Similar offerings are also given to other beings such as hungry ghosts, dakinis, protector deities, local divinities etc. Like other forms of Mahayana Buddhism, the practice of the five precepts and Bodhisattva vows is part of Tibetan Buddhist moral (sila) practice. In addition to these, there are also numerous sets of Tantric vows, termed Samaya, which are given as part of Tantric initiations. A popular compassion meditation in Tibetan Buddhism is Tonglen (sending and taking love and suffering respectively). Practices associated with Chenrezig (Avalokiteshvara), also tend to focus on compassion. The 14th Dalai Lama defines meditation (bsgom pa) as "familiarization of the mind with an object of meditation." Traditionally, Tibetan Buddhism follows the two main approaches to meditation or mental cultivation (bhavana) as taught in all forms of Buddhism, śamatha (Tib. Shine) and vipaśyanā (lhaktong). The practice of śamatha (calm abiding) is one of focusing one's mind on a single object such as a Buddha figure or the breath. Through repeated practice one's mind gradually becomes more stable, calm and happy. It is defined by Takpo Tashi Namgyal as "fixing the mind upon any object so as to maintain it without distraction...focusing the mind on an object and maintaining it in that state until finally it is channeled into one stream of attention and evenness." 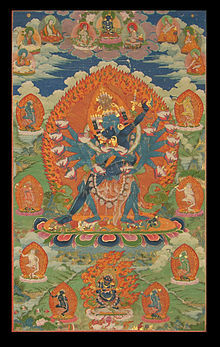 The nine mental abidings is the main progressive framework used for śamatha in Tibetan Buddhism. Once a meditator has reached the ninth level of this schema they achieve what is termed "pliancy" (Tib. shin tu sbyangs pa, Skt. prasrabdhi), defined as "a serviceability of mind and body such that the mind can be set on a virtuous object of observation as long as one likes; it has the function of removing all obstructions." This is also said to be very joyful and blissful for the body and the mind. The other form of Buddhist meditation is vipaśyanā (clear seeing, higher insight), which in Tibetan Buddhism is generally practiced after having attained proficiency in śamatha. This is generally seen as having two aspects, one of which is analytic meditation, thinking rationally about ideas and concepts in a scholarly or philosophical manner. As part of this process, entertaining doubts and engaging in internal debate over them is encouraged in some traditions. The other type of vipaśyanā is a non-analytical, "simple" yogic style called trömeh in Tibetan, which means "without complication". A meditation routine may involve alternating sessions of vipaśyanā to achieve deeper levels of realization, and samatha to consolidate them. Buddhist praying at a shrine in urga. Buddhists performing prostrations in front of Jokhang Monastery. Vajrayāna is believed by Tibetan Buddhists to be the fastest method for attaining Buddhahood but for unqualified practitioners it can be dangerous. To engage in it one must receive an appropriate initiation (also known as an "empowerment") from a lama who is fully qualified to give it. The aim of preliminary practices (ngöndro) is to start the student on the correct path for such higher teachings. Just as Sutrayāna preceded Vajrayāna historically in India, so sutra practices constitute those that are preliminary to tantric ones. Preliminary practices include all Sutrayāna activities that yield merit like hearing teachings, prostrations, offerings, prayers and acts of kindness and compassion, but chief among the preliminary practices are realizations through meditation on the three principle stages of the path: renunciation, the altruistic bodhicitta wish to attain enlightenment and the wisdom realizing emptiness. For a person without the basis of these three in particular to practice Vajrayāna can be like a small child trying to ride an unbroken horse. The most widespread preliminary practices include: taking refuge, prostration, Vajrasattva meditation, mandala offering and guru yoga. The merit acquired in the preliminary practices facilitates progress in Vajrayāna. While many Buddhists may spend a lifetime exclusively on sutra practices, however, an amalgam of the two to some degree is common. For example, in order to train in calm abiding, one might use a tantric visualisation as the meditation object. As in other Buddhist traditions, an attitude of reverence for the teacher, or guru, is also highly prized. At the beginning of a public teaching, a lama will do prostrations to the throne on which he will teach due to its symbolism, or to an image of the Buddha behind that throne, then students will do prostrations to the lama after he is seated. Merit accrues when one's interactions with the teacher are imbued with such reverence in the form of guru devotion, a code of practices governing them that derives from Indian sources. By such things as avoiding disturbance to the peace of mind of one's teacher, and wholeheartedly following his prescriptions, much merit accrues and this can significantly help improve one's practice. There is a general sense in which any Tibetan Buddhist teacher is called a lama. A student may have taken teachings from many authorities and revere them all as lamas in this general sense. However, he will typically have one held in special esteem as his own root guru and is encouraged to view the other teachers who are less dear to him, however more exalted their status, as embodied in and subsumed by the root guru. One particular feature of the Tantric view of teacher student relationship is that in Tibetan Buddhist Tantra, one is instructed to regard one's guru as an awakened Buddha. In Vajrayāna particularly, Tibetan Buddhists subscribe to a voluntary code of self-censorship, whereby the uninitiated do not seek and are not provided with information about it. This self-censorship may be applied more or less strictly depending on circumstances such as the material involved. A depiction of a mandala may be less public than that of a deity. That of a higher tantric deity may be less public than that of a lower. The degree to which information on Vajrayāna is now public in western languages is controversial among Tibetan Buddhists. Buddhism has always had a taste for esotericism since its earliest period in India. Tibetans today maintain greater or lesser degrees of confidentiality also with information on the vinaya and emptiness specifically. In Buddhist teachings generally, too, there is caution about revealing information to people who may be unready for it. Practicing tantra also includes the maintaining of a separate set of vows, which are called Samaya (dam tshig). There are various lists of these and they may differ depending on the practice and one's lineage or individual guru. Upholding these vows is said to be essential for tantric practice and breaking them is said to cause great harm. Ritual musical instruments from Tibet; MIM Brussels. The reading of the text - the 'lung' - during an empowerment for Chenrezig. There has been a "close association" between the religious and the secular, the spiritual and the temporal in Tibet. The term for this relationship is chos srid zung 'brel. Traditionally Tibetan lamas have tended to the lay populace by helping them with issues such as protection and prosperity. Common traditions have been the various rites and rituals for mundane ends, such as purifying one's karma, avoiding harm from demonic forces and enemies, and promoting a successful harvest. Divination and exorcism are examples of practices a lama might use for this. Ritual is generally more elaborate than in other forms of Buddhism, with complex altar arrangements and works of art (such as mandalas and thangkas), many ritual objects, hand gestures (mudra), chants, and musical instruments. A special kind of ritual called an initiation or empowerment (Sanskrit: Abhiseka, Tibetan: Wangkur) is central to Tantric practice. These rituals consecrate a practitioner into a particular Tantric practice associated with individual mandalas of deities and mantras. Without having gone through initiation, one is generally not allowed to practice the higher Tantras. Another important ritual occasion in Tibetan Buddhism is that of mortuary rituals which are supposed to assure that one has a positive rebirth and a good spiritual path in the future. Of central importance to Tibetan Buddhist Ars moriendi is the idea of the Bardo (Sanskrit: antarābhava), the intermediate or liminal state between life and death. Rituals and the readings of texts such as the Bardo Thodol are done to ensure that the dying person can navigate this intermediate state skillfully. Cremation and sky burial are traditionally the main funeral rites used to dispose of the body. The use of (mainly Sanskrit) prayer formulas, incantations or phrases called mantras (Tibetan: sngags) is another widespread feature of Tibetan Buddhist practice. So common is the use of mantras that Vajrayana is also sometimes called "Mantrayāna" (the mantra vehicle). Mantras are widely recited, chanted, written or inscribed, and visualized as part of different forms of meditation. Each mantra has symbolic meaning and will often have a connection to a particular Buddha or Bodhisattva. Each deity's mantra is seen as symbolizing the function, speech and power of the deity. Tibetan Buddhist practitioners repeat mantras in order to train the mind, and transform their thoughts in line with the divine qualities of the mantra's deity and special power. Mantras are effective because they help keep your mind quiet and peaceful, automatically integrating it into one-pointedness. They make your mind receptive to very subtle vibrations and thereby heighten your perception. Their recitation eradicates gross negativities and the true nature of things can then be reflected in your mind’s resulting clarity. By practising a transcendental mantra, you can in fact purify all the defiled energy of your body, speech, and mind. if a mantra is thought to be something ordinary and not seen for what it is, it will not be able to perform its intended function. Mantras are like non-conceptual wish-fulfilling jewels. Infusing one's being with the blessings of mantra, like the form of a moon reflected on a body of water, necessitates the presence of faith and other conditions that set the stage for the spiritual attainments of mantra. Just as the moon's reflection cannot appear without water, mantras cannot function without the presence of faith and other such factors in one's being. Mantras are part of the highest tantric practices in Tibetan Buddhism, such as Deity Yoga and are recited and visualized during tantric sadhanas. Thus, Tsongkhapa says that mantra "protects the mind from ordinary appearances and conceptions". This is because in Tibetan Buddhist Tantric praxis, one must develop a sense that everything is divine. Chöd ritual, note the use of Damaru drum and hand-bell, as well as the Kangling (thighbone trumpet). In what is called higher yoga tantra the emphasis is on various yoga practices which allow the practitioner to realize the true nature of reality. If Buddhahood is a source of infinite potentiality accessible at any time, then the Tantric deities are in a sense partial aspects, refractions of that total potentiality. Visualizing one of these deities, or oneself identifying with one of them, is not, in Tibetan Tantric thought, a technique to worship an external entity. Rather, it is a way of accessing or tuning into something that is an intrinsic part of the structure of the universe — as of course is the practitioner him or herself. Deity yoga involves two stages, the generation stage and the completion stage. In the generation stage, one dissolves the mundane world and visualizes one's chosen deity (yidam), its mandala and companion deities, resulting in identification with this divine reality. In the completion stage, one dissolves the visualization of and identification with the yidam in the realization of sunyata or emptiness. Completion stage practices can also include subtle body energy practices, as well as other practices such as the Six Yogas of Naropa. The views and practices associated with Dzogchen and Mahamudra are often seen as the culmination of the tantric path. These practices focus on the very nature of reality and experience, termed dharmakaya or rigpa. Rangjung Rigpe Dorje, the 16th Karmapa, with Freda Bedi (the first Western nun in Tibetan Buddhism), at Rumtek Monastery, Sikkim. Chagdud Tulku Rinpoche, a tulku and a ngagpa (note the white and red robes). Buddhist monasticism is an important part of the Tibetan Buddhist tradition, all the major and minor schools maintain large monastic institutions based on the Mulasarvastivada Vinaya (monastic rule) and many religious leaders come from the monastic community. That being said, there are also many religious leaders or teachers (called Lamas and Gurus) which are not celibate monastics. According to Geoffrey Samuel this is where "religious leadership in Tibetan Buddhism contrasts most strongly with much of the rest of the Buddhist world." Lamas are generally skilled and experienced tantric practitioners and ritual specialists in a specific initiation lineage and may be laypersons or monastics. They act not just as teachers, but as spiritual guides and guardians of the lineage teachings that they have received through a long and intimate process of apprenticeship with their Lamas. 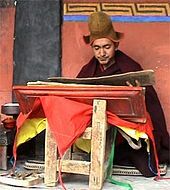 Tibetan Buddhism also includes a number of lay clergy and lay tantric specialists, such as Ngagpas (Skt. mantrī), Gomchens, Serkyims, and Chödpas (practicioners of Chöd). According to Samuel, in the more remote parts of the Himalayas, communities were often led by lay religious specialists. Thus, while the large monastic institutions were present in the regions of the Tibetan plateau which were more centralized politically, in other regions they were absent and instead smaller gompas and more lay oriented communities prevailed. Small communities of lay practitioners attached to a temple and a lama. Lay practitioners might stay in the gompa for periodic retreats. Small communities of celibate monastics attached to a temple and a lama, often part of a village. Medium to large communities of celibate monastics. These could maintain several hundred monks and might have extensive land holdings, be financially independent, and sometimes also act as trading centers. Large teaching monasteries with thousands of monks, such as the big Gelug establishments of Sera (with over 6000 monks in the first half of the 20th century) and Drepung (over 7000). In some cases a lama is the leader of a spiritual community. Some lamas gain their title through being part of particular family which maintains a lineage of hereditary lamas (and are thus often laypersons). One example is the Sakya family of Kon, who founded the Sakya school and another is the hereditary lamas of Mindrolling monastery. In other cases, lamas may be seen as "Tülkus" ("incarnations"). Tülkus are figures which are recognized as reincarnations of a particular bodhisattva or a previous religious figure. They are often recognized from a young age through the use of divination and the use of the possessions of the deceased lama, and therefore are able to receive extensive training. They are sometimes groomed to become leaders of monastic institutions. Examples include the Dalai Lamas and the Karmapas, each of which are seen as key leaders in their respective traditions. Although the system of incarnate lamas is popularly held to be an innovation, it is disputable that this is a distinctly Tibetan development. Two centuries before Buddhism was introduced to Tibet, in the fifth century CE, the Abhidharma teacher Buddhaghoṣa was declared by Sri Lankan elders to be a reincarnation of the bodhisattva Maitreya. Another title unique to Tibetan Buddhism is that of Tertön (treasure discoverer), who are considered capable of revealing or discovering special revelations or texts called Termas (lit. "hidden treasure"). They are also associated with the idea of beyul ("hidden valleys"), which are power places associated with deities and hidden religious treasures. Painting of Ayu Khandro at Merigar West. The seat of Chogyal Namkhai Norbu and The Dzogchen Community in Italy. Women in Tibetan society, though still unequal, tended to have a relatively greater autonomy and power than in surrounding societies. This might be because of the smaller household sizes and low population density in Tibet. Women traditionally took many roles in Tibetan Buddhism, from lay supporters, to monastics, lamas and tantric practitioners. 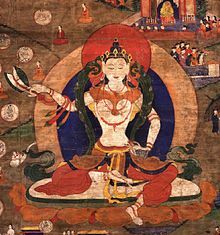 There is evidence for the importance of female practitioners in Indian Tantric Buddhism and pre-modern Tibetan Buddhism. At least one major lineage of tantric teachings, the Shangpa Kagyu, traces itself to Indian female teachers and there have been a series of important female Tibetan teachers, such as Yeshe Tsogyal and Machig Labdrön. It seems that even though it might have been more difficult for women to become serious tantric yoginis, it was still possible for them to find lamas that would teach them high tantric practices. Some Tibetan women become lamas by being born in one of the hereditary lama families such as Mindrolling Jetsün Khandro Rinpoche and Sakya Jetsün Kushok Chimey Luding. There have also been cases of influential female lamas who were also tertöns, such as Sera Khandro, Tare Lhamo and Ayu Khandro. Some of these figures were also tantric consorts (sangyum, kandroma) with male lamas, and thus took part in the sexual practices associated with the highest levels of tantric practice. While monasticism is practiced there by women, it is much less common (2 percent of the population in the 20th century compared to 12 percent of men). Nuns were also much less respected by Tibetan society than monks and may receive less lay support than male monastics. There are accounts of fully ordained Tibetan women, such as the Samding Dorje Phagmo (1422-1455), who was once ranked the highest female master and tulku in Tibet, but very little is known about the exact circumstances of their ordination. Buddhist author Michaela Haas notes that Tibetan Buddhism is undergoing a sea change in the West, with women playing a much more central role. Freda Bedi[note 7] was a British woman who was the first Western woman to take ordination in Tibetan Buddhism, which occurred in 1966. Pema Chödrön was the first American woman to be ordained as a Buddhist nun in the Tibetan Buddhist tradition. In 2010 the first Tibetan Buddhist nunnery in America, Vajra Dakini Nunnery in Vermont, was officially consecrated. It offers novice ordination and follows the Drikung Kagyu lineage of Buddhism. The abbot of the Vajra Dakini nunnery is Khenmo Drolma, an American woman, who is the first bhikṣuṇī in the Drikung lineage of Buddhism, having been ordained in Taiwan in 2002. She is also the first westerner, male or female, to be installed as an abbot in the Drikung Kagyu lineage of Buddhism, having been installed as the abbot of the Vajra Dakini Nunnery in 2004. The Vajra Dakini Nunnery does not follow The Eight Garudhammas. In April 2011, the Institute for Buddhist Dialectical Studies (IBD) in Dharamsala, India, conferred the degree of geshe, a Tibetan Buddhist academic degree for monastics, on Kelsang Wangmo, a German nun, thus making her the world's first female geshe. In 2013 Tibetan women were able to take the geshe exams for the first time. In 2016 twenty Tibetan Buddhist nuns became the first Tibetan women to earn geshe degrees. Jetsunma Ahkon Lhamo gained international attention in the late 1980s as the first Western woman to be a His Holininess Penor Rinpoche enthroned tulku within the Nyingma Palyul. The Nyingma traditions, associated with the first transmission figures such as Shantarakshita, Padmasambhava and King Trisong Deutsen and with Dzogchen teachings. The Kadam Lineage, associated with Atisha and his pupil Dromtön (1005–1064). Lamdré, traced back to the Indian Mahasiddha Virupa, and today preserved in the Sakya school. Marpa Kagyu, the lineage which stems from Marpa, Milarepa and Gampopa, practices Mahamudra and the Six Dharmas of Naropa, and includes the four major and eight minor Kagyu lineages. Shyijé and Chöd which originate from Padampa Sangyé and Machig Labdrön. Dorje Naljor Druk (the 'Six Branch Practice of Vajrayoga') which is derived from the Kalachakra lineage. Dorje sumgyi nyendrup ('Approach and Accomplishment of the Three Vajras'), from the mahasiddha Orgyenpa Rinchen Pal. There various schools or traditions of Tibetan Buddhism. The four main traditions ones overlap markedly, such that "about eighty percent or more of the features of the Tibetan schools are the same". Differences include the use of apparently, but not actually, contradictory terminology, opening dedications of texts to different deities and whether phenomena are described from the viewpoint of an unenlightened practitioner or of a Buddha. On questions of philosophy, there has historically been disagreement regarding the nature of Yogacara and Buddha-nature teachings (and whether these are of expedient meaning or ultimate meaning), which still colours the current presentations of sunyata (emptiness) and ultimate reality. The 19th century Rimé movement downplayed these differences, as still reflected in the stance of the Fourteenth Dalai Lama, who states that there are no fundamental differences between these schools. However, there are still philosophical disagreements between the different traditions, such as the debate regarding rangtong and shentong interpretations of Madhyamaka philosophy. The four major schools are sometimes divided into the Nyingma "Old Translation," and Sarma "New Translation" traditions, which follow different canons of scripture (the Nyingma Gyubum along with Termas and the Tengyur-Kangyur respectively). Each school also traces itself to a certain lineage going back to India as well as certain important Tibetan founders. While all the schools share most practices and methods, each school tends to have a certain preferred focus (see table below). Another common but trivial differentiation is into the Yellow Hat (Gelug) and Red Hat (non-Gelug) sects. "The Ancient Ones" is the oldest school of Tibetan Buddhism and the original order founded by Padmasambhava (8th century) and Śāntarakṣita (725–788). Whereas other schools categorize their teachings into the three yānas or "vehicles", Hīnayāna, Mahāyāna and Vajrayāna, the Nyingma tradition classifies its teachings into Nine Yānas, among the highest of which is Dzogchen. Terma "treasures" (revealed texts) are of particular significance to the Nyingma school. One of the most influential terma cycles is the Longchen Nyingthig which was revealed by Jigme Lingpa (1730–1798). The "Grey Earth" school represents one of the first Sarma (new translation) scholarly traditions. Headed by the Sakya Trizin, this tradition was founded by Khön Könchok Gyelpo (Wylie: 'khon dkon mchog rgyal po, 1034–1102), a disciple of the great Lotsawa, Drogmi Shākya (Wylie: brog mi lo tsā wa ye shes) and traces its lineage to the mahasiddha Virūpa. 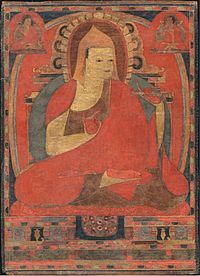 A renowned exponent, Sakya Pandita (1182–1251CE), was the great-grandson of Khön Könchok Gyelpo. Sakyapa, the last one, was named because of the Sakya Monastery, of which the wall was painted into Red, White, and Cyan. The Bodong school is one of the minor schools, being much smaller and less influential than the four main schools. This tradition was founded in 1049 by the Kadam teacher Mudra Chenpo, who also established the Bodong E Monastery. Its most famous teacher was Bodong Penchen Lénam Gyelchok (1376-1451) who authored over one hundred and thirty-five volumes. This tradition is also known for maintaining a female tulku lineage of incarnated lamas called the Samding Dorje Phagmo. The Dagpo Kagyu, encompasses those Kagyu schools that trace back to the Indian master Naropa via Marpa Lotsawa, Milarepa and Gampopa and consists of four major sub-sects: the Karma Kagyu, headed by a Karmapa, the Tsalpa Kagyu, the Barom Kagyu, and Pagtru Kagyu. There are a further eight minor sub-sects, all of which trace their root to Pagtru Kagyu's founder, Phagmo Drupa. The most notable of these are the Drikung and Drukpa Lineages. The once-obscure Shangpa Kagyu, which was famously represented by the 20th century teacher Kalu Rinpoche, traces its history back to the Indian female siddhas Niguma and Sukhasiddhi, transmitted to Tibet via Khyungpo Naljor in the 11th century. The Jonang is a minor school which can be traced to early 12th century master Yumo Mikyo Dorje, but was popularized by the influential master Dölpopa Shérap Gyeltsen (1292–1361). 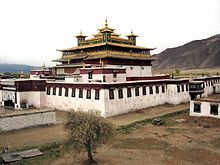 The Jonang re-established their religio-political center in Golok, Nakhi and Mongol areas in Kham and Amdo centered at Dzamthang Monastery and have continued practicing uninterrupted to this day. The tradition was suppressed in 1650 in Gelug-controlled regions and subsequently banned and its monks and nuns converted to the Gelug school in 1658. An estimated 5,000 monks and nuns of the Jonang tradition practice today in these areas and at the edges of historic Gelug influence. However, their teachings were limited to these regions until the Rimé movement of the 19th century encouraged the study of non-Gelug schools of thought and practice. In modern times it has been encouraged to grow by the 14th Dalai Lama, who installed the 9th Jebtsundamba Khutughtu as its head. The "Way of Virtue" school was originally a reformist movement and is known for its emphasis on logic and debate. The order was founded in the 14th to 15th century by Je Tsongkhapa, renowned for both his scholarship and virtue. He was a prominent supporter of the Madhyamika philosophy and formalized the Svatantrika-Prasaṅgika distinction. Its spiritual head is the Ganden Tripa and its temporal one the Dalai Lama. The Dalai Lama is regarded as the embodiment of Avalokiteśvara. After the civil war in the 17th century and the Mongol intervention, the Gelugpa school dominated Tibetan Buddhism, and successive Dalai Lamas ruled Tibet from the mid-17th to mid-20th centuries. Gelugpa is the youngest but largest sect of Tibetan Buddhism. People also call it the Yellow Sect due to the hat they wear is yellow color. The founder of Gelugpa is Tsongkhapa, a great master. The discipline of Gelugpa is very strict. Followers could not get married, could not eat meat, could not drink alcoholic beverages. Most of the famous monasteries in Tibet admire Gelugpa, such as Ganden Monastery, Drepung Monastery, Sera Monastery in Lhasa, and Tashilhunpo Monastery in Shigatse. The New Kadampa Tradition is a Buddhist new religious movement founded by Kelsang Gyatso in England in 1991, which branched-off from the Gelugpa school. While Yungdrung Bon considers itself a separate religion with pre-Buddhist origins, and it is considered as non-Buddhist by the main Tibetan traditions, it shares so many similarities and practices with mainstream Tibetan Buddhism that some scholars such as Geoffrey Samuel see it as "essentially a variant of Tibetan Buddhism". It is much more related to Nyingma Buddhism, and includes Dzogchen teachings, similar deities, rituals and forms of monasticism. ^ Kamalaśīla wrote the three Bhāvanākrama texts (修習次第三篇) after that. ^ However, a Chinese source found in Dunhuang written by Mo-ho-yen says their side won, and some scholars conclude that the entire episode is fictitious. ^ Under the Mulasarvastivadin Vinaya, as with the two other extant Vinaya lineages today (Theravada and Dharmaguptaka), in order to ordain bhikṣuṇīs, there must be quorums of both bhikṣuṇīs and bhikṣus; without both, a woman cannot be ordained as a nun (Tibetan: དགེ་སློང་མ་, THL: gélongma). In 2005, the Dalai Lama repeatedly spoke about the bhikṣuṇī ordination in public gatherings. In Dharamsala, he encouraged, "We need to bring this to a conclusion. We Tibetans alone can't decide this. Rather, it should be decided in collaboration with Buddhists from all over the world. Speaking in general terms, were the Buddha to come to this 21st century world, I feel that most likely, seeing the actual situation in the world now, he might change the rules somewhat...."
Later, in Zürich during a 2005 conference of Tibetan Buddhist Centers, he said, "Now I think the time has come; we should start a working group or committee" to meet with monks from other Buddhist traditions. Looking at the German bhikṣuṇī Jampa Tsedroen, he instructed, "I prefer that Western Buddhist nuns carry out this work… Go to different places for further research and discuss with senior monks (from various Buddhist countries). I think, first, senior bhikshunis need to correct the monks' way of thinking. "This is the 21st century. Everywhere we are talking about equality….Basically Buddhism needs equality. There are some really minor things to remember as a Buddhist--a bhikshu always goes first, then a bhikshuni….The key thing is the restoration of the bhikshuni vow." ^ Powers, John (2007). Introduction to Tibetan Buddhism (Rev. ed.). Ithaca, New York: Snow Lion Publications. pp. 392–3, 415. ISBN 978-1-55939-282-2. ^ Dzogchen Ponlop, Wild Awakening: The Heart of Mahamudra and Dzogchen, Glossary. ^ a b Powers, John; Templeman, David (2012). Historical Dictionary of Tibet, Scarecrow Press, p. 566. ^ Lopez, Donald S. Jr. (1999). Prisoners of Shangri-La: Tibetan Buddhism and the West. Chicago: University of Chicago Press. pp. 6, 19f. ISBN 0-226-49311-3. ^ Damien Keown, ed., "Lamaism", A Dictionary of Buddhism (Oxford, 2004): "an obsolete term formerly used by Western scholars to denote the specifically Tibetan form of Buddhism due to the prominence of the lamas in the religious culture. . . should be avoided as it is misleading as well as disliked by Tibetans." Robert E. Buswell Jr. and David S. Lopez Jr., eds., "Lamaism", The Princeton Dictionary of Buddhism (Princeton, 2017): "an obsolete English term that has no correlate in Tibetan. . . Probably derived from the Chinese term lama jiao, or "teachings of the lamas", the term is considered pejorative by Tibetans, as it carries the negative connotation that the Tibetan tradition is something distinct from the mainstream of Buddhism." John Bowker, ed., "Lamaism", The Concise Oxford Dictionary of World Religions (Oxford, 2000): "a now antiquated term used by early W[estern] commentators (as L. A. Waddell, The Buddhism of Tibet, or Lamaism, 1895) to describe Tibetan Buddhism. Although the term is not accurate [it] does at least convey the great emphasis placed on the role of the spiritual teacher by this religion." ^ Snellgrove, David (1987). Indo-Tibetan Buddhism. Indian Buddhists & Their Tibetan Successors, Vol.2. Boston: Shambala Publications. ISBN 0-87773-379-1. ^ Beckwith, C.I. : The revolt of 755 in Tibet, in: The History of Tibet, ed. Alex McKay, Vol. 1, London 2003, p. 273-285 (discusses the political background and the motives of the ruler). ^ Shakabpa. pp. 53, 173. ^ Samuel 2012, p. 10. ^ Samuel 2012, pp. 12-13, 32. ^ "How Tibet Emerged Within the Wider Chinese Power-Political Zone". Long Revolution. 2015-04-18. Retrieved 2018-03-23. ^ Wylie 1990, p. 104. ^ Powers 2007, p. 162. ^ Patrick Taveirne (1 January 2004). Han-Mongol Encounters and Missionary Endeavors: A History of Scheut in Ordos (Hetao) 1874-1911. Leuven University Press. pp. 67–. ISBN 978-90-5867-365-7. ^ Weidner, Marsha Smith. Cultural Intersections in Later Chinese Buddhism, p. 173. ^ Schaik, Sam van. Tibet: A History. Yale University Press 2011, page 165-9. ^ Schaik, Sam van. Tibet: A History. Yale University Press 2011, page 169. ^ Kapstein, Matthew T. Tibetan Buddhism: A Very Short Introduction. New York: Oxford University Press, 2014, p. 100. ^ a b Kapstein, Matthew T. Tibetan Buddhism: A Very Short Introduction. New York: Oxford University Press, 2014, p. 108. ^ Cantwell, Cathy; Kawanami, Hiroko (2016). Religions in the Modern World (3rd ed.). New York: Routledge. p. 91. ISBN 978-0-415-85881-6. ^ a b Kapstein, Matthew T. Tibetan Buddhism: A Very Short Introduction. New York: Oxford University Press, 2014, p. 110. ^ Samuel 2012, p. 238. ^ Kapstein, Matthew T. Tibetan Buddhism: A Very Short Introduction. New York: Oxford University Press, 2014, p. 109. ^ Samuel 2012, p. 240. ^ Samuel 2012, pp. 242-243. ^ Powers 2007, pp. 65, 71, 75. ^ Powers 2007, pp. 102. ^ Samuel 2012, p. 75. ^ Cf. Dhargyey (1978), 64f; Dhargyey (1982), 257f, etc; Pabongkhapa Déchen Nyingpo, 364f; Tsong-kha-pa II: 183f. The former are the afflictions, negative states of mind, and the three poisons – desire, anger, and ignorance. The latter are subtle imprints, traces or "stains" of delusion that involves the imagination of inherent existence. ^ Samuel 2012, p. 54. ^ The Sakya school, too, has a somewhat similar textual form, the lamdré. ^ Kapstein, Matthew T. Tibetan Buddhism: A Very Short Introduction. New York: Oxford University Press, 2014, p. 52-53. ^ Powers, 2007, p. 250. ^ Samuel 2012, p. 69. ^ a b Kapstein, Matthew T. Tibetan Buddhism: A Very Short Introduction. New York: Oxford University Press, 2014, p. 82. ^ a b Kapstein, Matthew T. Tibetan Buddhism: A Very Short Introduction. New York: Oxford University Press, 2014, p. 83. ^ Cornu 2001, p. 135. ^ a b c d Kapstein, Matthew T. Tibetan Buddhism: A Very Short Introduction. New York: Oxford University Press, 2014, p. 67. ^ Cornu 2001, p. 136. ^ Cornu 2001, p. 146-147. ^ a b Cornu 2001, p. 145. ^ a b Brunnhölzl 2004. ^ Sopa & Hopkins (1977), 67-69; Hopkins (1996). ^ Kapstein, Matthew T. Tibetan Buddhism: A Very Short Introduction. New York: Oxford University Press, 2014, p. 63. ^ Samuel 2012, pp. 19-20. ^ Orzech, Charles D. (general editor), 2011. Esoteric Buddhism and the Tantras in East Asia. Brill, p. 540. ^ Samuel 2012, p. 21. ^ Kapstein, Matthew T. Tibetan Buddhism: A Very Short Introduction. New York: Oxford University Press, 2014, p. 64. ^ Samuel 2012, p. 20. ^ Samuel 2012, p. 32. ^ Samuel 2012, p. 78. ^ Powers 2007, p. 271. ^ Samuel 2012, p. 50. ^ Kapstein, Matthew T. Tibetan Buddhism: A Very Short Introduction. New York: Oxford University Press, 2014, p. 45-46. ^ Powers 2007, p. 81. ^ Powers 2007, p. 86. ^ Powers 2007, p. 88. ^ Powers 2007, p. 90. ^ Powers 2007, p. 91. ^ khri byang blo bzang ye shes bstan ʼdzin rgya mtsho 2006, p. 66, 212f. ^ Kalu Rinpoche (1986), The Gem Ornament of Manifold Instructions. Snow Lion, p. 21. ^ Powers 2007, p. 295. ^ Indian tradition (Cf. Saddharmapundarika Sutra II, 124) encourages the student to view the guru as representative of the Buddha himself. ^ a b Kapstein, Matthew T. Tibetan Buddhism: A Very Short Introduction. New York: Oxford University Press, 2014, p. 80. ^ Cf. Conze (1993), 26 and 52f. ^ Powers 2007, p. 315. ^ Cueppers, Christoph. "The Relationship Between Religion and State (chos srid zung 'brel) In Traditional Tibet". ^ Kapstein, Matthew T. Tibetan Buddhism: A Very Short Introduction. New York: Oxford University Press, 2014, p. 2. ^ Kapstein, Matthew T. Tibetan Buddhism: A Very Short Introduction. New York: Oxford University Press, 2014, p. 5. ^ Kapstein, Matthew T. Tibetan Buddhism: A Very Short Introduction. New York: Oxford University Press, 2014, p. 81. ^ a b Kapstein, Matthew T. Tibetan Buddhism: A Very Short Introduction. New York: Oxford University Press, 2014, p. 94. ^ Jamgon Mipham, Luminous Essence: A Guide to the Guhyagarbha Tantra, page 147. ^ Tsoṅ-kha-pa Blo-bzaṅ-grags-pa. Tantra in Tibet: The Great Exposition of Secret Mantra, Motilal Banarsidass Publ., 1987, page 47. ^ Samuel 2012, p. 71. ^ Kapstein, Matthew T. Tibetan Buddhism: A Very Short Introduction. New York: Oxford University Press, 2014, p. 87. ^ Samuel 2012, p. 130. ^ Samuel 2012, pp. 131-134. ^ Samuel 2012, p. 141. ^ Samuel 2012 p. 158. ^ Samuel 2012 pp. 159-162. ^ Chapman F. Spencer. Lhasa the Holy City, p. 195. Readers Union Ltd., London. ^ Samuel 2012, pp. 140-141. ^ Samuel 2012, p. 146. ^ Samuel 2012, p. 144. ^ Samuel 2012, p. 206. ^ Samuel 2012, p. 214. ^ Samuel 2012, p. 216. ^ Samuel 2012, p. 215. ^ Samuel 2012, p. 211. ^ Tsomo 1999, p. 22. ^ Tsomo 1999, p. 76. ^ Samuel 2012, p. 213. ^ "A Female Dalai Lama? Why It Matters". The Huffington Post. Retrieved May 4, 2013. Of all these changes that we are watching Buddhism undergo in the West, the most momentous may be that women are playing an equal role. ^ "Nonfiction Book Review: The Revolutionary Life of Freda Bedi: British Feminist, Indian Nationalist, Buddhist Nun by Vicki Mackenzie. Shambhala, $16.95 trade paper (208p) ISBN978-1-61180-425-6". Publishersweekly.com. Retrieved 2017-06-10. ^ "Works by Chögyam Trungpa and His Students". Dharma Haven. Dharma Haven. June 23, 1999. Retrieved 2013-10-14. ^ "Ani Pema Chödrön". Gampoabbey.org. Archived from the original on 2010-11-17. Retrieved 2010-11-19. ^ a b "Women Making History". Vajradakininunnery.org. Archived from the original on 2010-06-01. Retrieved 2010-11-19. ^ "Khenmo Drolma". Vajradakininunnery.org. Archived from the original on 2010-06-01. Retrieved 2010-11-19. ^ "Vajra Dakini Nunnery". Vajra Dakini Nunnery. Retrieved 2010-11-19. ^ Haas, Michaela (2011-05-18). "2,500 Years After The Buddha, Tibetan Buddhists Acknowledge Women". Huffington Post. ^ "Geshe Kelsang Wangmo, An Interview with the World's First Female Geshe « Mandala Publications". Mandalamagazine.org. Archived from the original on 2013-04-15. Retrieved 2014-08-25. ^ Haas, Michaela. "Buddhist nun professors or none? – OnFaith". The Washington Post. ^ Nuns, Tibetan (2016-07-14). "Tibetan Buddhist Nuns Make History: Congratulations Geshema Nuns! - The Tibetan Nuns Project". Tnp.org. Retrieved 2016-10-04. ^ July 15, 2016 (2016-07-15). "Twenty Tibetan Buddhist nuns are first ever to earn Geshema degrees - Lion's Roar". Lionsroar.com. Retrieved 2016-10-04. ^ Stevens, William K. (1988-10-26). "U.S. Woman Is Named Reborn Buddhist Saint". New York Times. Retrieved 2008-07-26. ^ Kongtrul, Jamgon; Harding, Sarah (translator).The Treasury of Knowledge: Book Eight, Part Four: Esoteric Instructions, Shambhala, 2009, pp. 27-28. ^ Samuel 2012, p. 56. ^ Samuel 2012, p. 232. Conze, Edward (1993). A Short History of Buddhism (2nd ed.). Oneworld. ISBN 1-85168-066-7. 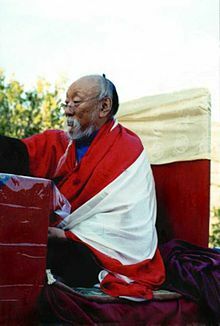 Lati Rinpoche (1980). Elizabeth Napper (ed.). Mind in Tibetan Buddhism: Oral Commentary on Ge-shay Jam-bel-sam-pel's "Presentation of Awareness and Knowledge Composite of All the Important Points Opener of the Eye of New Intelligence. Translated by Napper. Valois, NY: Snow Lion. ISBN 0-937938-02-5. Mullin, Glenn H (15 December 2008). Living in the Face of Death: The Tibetan Tradition. Snow Lion Publications. ISBN 978-1-55939-908-1. Nyanaponika Thera (1965). The Heart of Buddhist Meditation. Boston: Weiser. ISBN 0-87728-073-8.
pha bong kha pa byams pa bstan ʼdzin ʼphrin las rgya mtsho; khri byang blo bzang ye shes bstan ʼdzin rgya mtsho; Michael Richards (3 November 2006). Liberation in the Palm of Your Hand: A Concise Discourse on the Path to Enlightenment. Simon and Schuster. ISBN 978-0-86171-500-8. Ringu Tulku. The Ri-Me Philosophy of Jamgon Kongtrul the Great: A Study of the Buddhist Lineages of Tibet. Shambhala. ISBN 1-59030-286-9. Tsomo, Karma Lekshe (1 April 1999). Buddhist Women Across Cultures: Realizations. State University of New York Press. ISBN 978-0-7914-4138-1. Tsong-kha-pa (2000). Joshua Cutler; Guy Newland (eds.). The Great Treatise on the Stages of the Path to Enlightenment, Volume I. Canada: Snow Lion. ISBN 1-55939-152-9. Tsong-kha-pa (2002). Joshua Cutler; Guy Newland (eds.). The Great Treatise on the Stages of the Path to Enlightenment, Volume II. Canada: Snow Lion. ISBN 1-55939-168-5. Tsong-kha-pa (2004). Joshua Cutler; Guy Newland (eds.). The Great Treatise on the Stages of the Path to Enlightenment, Volume III. Canada: Snow Lion. ISBN 1-55939-166-9. Yeshe De Project (1986): Ancient Tibet: Research Materials from The Yeshe De Project. Dharma Publishing, Berkeley, California. ISBN 0-89800-146-3. Ringu Tulku (2006). The Ri-Me Philosophy of Jamgon Kongtrul the Great: A Study of the Buddhist Lineages of Tibet. Shambhala. ISBN 978-1-59030-286-6. Cabezón, José Ignacio (2006-10-26). "Tibetan Buddhist Society". In Juergensmeyer, Mark (ed.). The Oxford Handbook of Global Religions. doi:10.1093/oxfordhb/9780195137989.003.0010. Wikimedia Commons has media related to Tibetan Buddhism. Wikisource has the text of the 1911 Encyclopædia Britannica article Lāmāism.